Shortly after my daughter turned one, I did a post entitled: "My 1 Year Old's Top 10 Favorite Books." Now that my son Shepherd has just turned one, I thought I would do a similar post. But doing 10, wasn't going to work. He hasn't clung to books the way my daughter did, and while he does enjoy one of her one year old favorites (Today is Monday by Eric Carle). The other's haven't grabbed him in the same way. Instead though, it's very easy for me to identify his favorite book. So instead of a top 10, he gets a top 1. 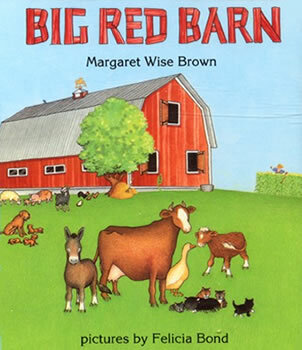 When I sit him down in the little club chair and read him a bed time story he will always sit still for a peaceful and calm reading of Big Red Barn by Margaret Wise Brown. And I won't lie, I enjoy it to. Something about it's rhythm (although sometimes slightly less than rhythmic), it's nothing-special pictures that line up well with the book, and the irregular amount of text on each page makes this an enjoyable read for both of us. This is absolutely one of the best books ever. I read Margaret Wise Brown as a child (I'm 53) and this one - in both it's full-size picture book and boardbook versions - was a favorite of my children. Looking for the butterflies was always a fun sidelight!